Mammoth Lakes Recreation announced today that it has received a pledge for $75,000 from local geothermal energy producer Mammoth Pacific Geothermal to assist with the construction of a new inclusive playground in Mammoth Lakes. The playground, which is located at Mammoth Creek Park West, is designed to allow people of all abilities, including those with cognitive, developmental and physical challenges to use the facilities. Mammoth Pacific’s gift will be used to install additional impact absorbent accessible surfacing to allow wheelchair access and other mobility-assisting devices on and around the playground. “Access is a critical component of inclusive play,” notes Betsy Truax, Chair of the Mammoth Lakes Recreation Commission. 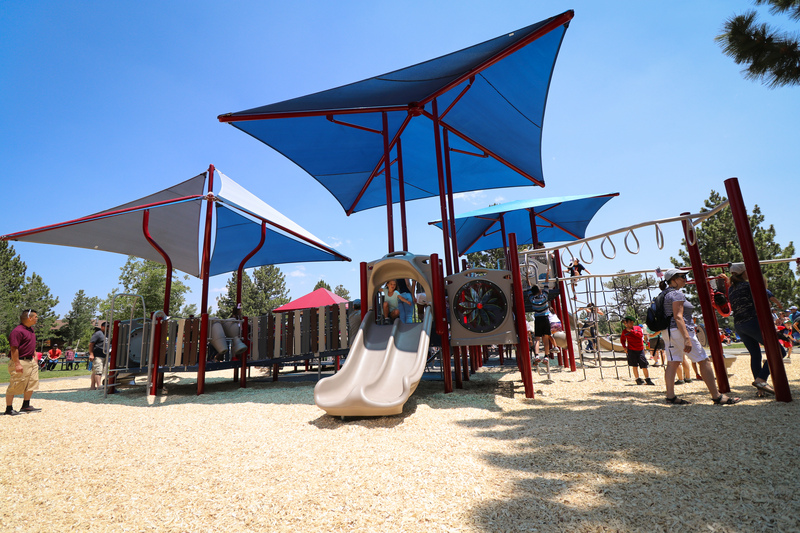 Truax, along with the Town of Mammoth Lakes Parks and Recreation Director, Stuart Brown, were instrumental in securing a PlayCore grant to provide the initial funding for the playground. The new park will be designated a National Demonstration Site (NDS) for inclusive play after it opens. Representatives from Mammoth Pacific Geothermal will be joining members of the Mammoth Lakes Town Council, PlayCore, and local volunteers who assisted in the community build effort, at a ribbon cutting ceremony for the playground on Wednesday, July 4th, at 1:00 p.m.
With over five decades of experience, Ormat Technologies, Inc. is a leading geothermal Company and the only vertically integrated Company engaged in geothermal and recovered energy generation (REG), with the objective of becoming a leading global provider of renewable energy. The Company owns, operates, designs, manufactures and sells geothermal and REG power plants primarily based on the Ormat Energy Converter – a power generation unit that converts low-, medium- and high-temperature heat into electricity. With 77 U.S. patents, Ormat’s power solutions have been refined and perfected under the most grueling environmental conditions. Ormat has 530 employees in the United States and 770 overseas. Ormat’s flexible, modular solutions for geothermal power and REG are ideal for the vast range of resource characteristics. The Company has engineered, manufactured and constructed power plants, which it currently owns or has installed to utilities and developers worldwide, totaling over 2,600 MW of gross capacity. Ormat’s current 851 MW generating portfolio is spread globally in the U.S., Guatemala, Guadeloupe, Honduras, Indonesia and Kenya. In March 2017, Ormat expanded its operations to provide energy storage and energy management solutions, by leveraging its core capabilities and global presence as well as through its Viridity Energy Solutions Inc. subsidiary, a Philadelphia-based Company with nearly a decade of expertise and leadership in energy storage, demand response and energy management.